Ready in 2 mins. Genuine goodness. Gluten free. Free from artificial colours, flavours and preservatives. 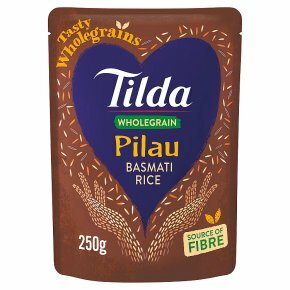 Suitable for vegetarians.Our Classic Grains have been selected to help you create delicious and wholesome meals in minutes. An aromatic blend of cumin and fenugreek infuses our nutty and nutritious wholegrain Basmati grains with exotic Indian flavours. Why not try... Perfect with a spicy prawn curry. Add leftover lamb and vegetables to create a quick and easy Biryani. Squeeze pouch, tear strip, microwave 800W 2 mins.Microwave ovens may vary.Adjust cooking time accordingly.